Officials with the BJ's Restaurants chain said they're investigating how a dead frog wound up in a diner's salad at one of the company's locations in West Covina, Los Angeles County. 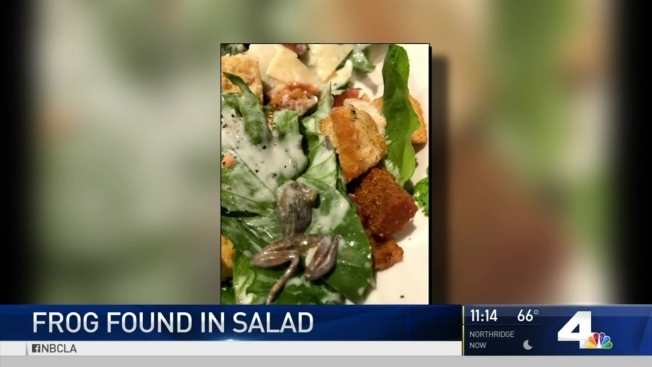 Shawna Cepeda posted a picture of her salad with a frog that appeared to be the size of two croutons in a Yelp review on June 14. Cepeda couldn't be reached Saturday, but in her Yelp post, she said she ate at the restaurant the previous night and ordered a side salad. "I was about four bites into it and I noticed it tasted a little different," she wrote. "I thought maybe the ranch dressing was a little bitter, and after mixing the salad around some more I found a dead baby frog." The manager offered to comp her meal, which she declined. She said corporate apologized and sent her a $50 gift card. Krysteen Romero, the general manager at the restaurant, posted a comment on Cepeda's Yelp page more than a week later apologizing and offering to speak to her directly. In a statement issued to NBC4, BJ's Chief Financial Officer Greg Levin said the company takes this seriously and they "have launched an internal investigation including discussions with our suppliers and distributors to ensure that nothing like this happens in the future."